Just because your business hasn't experienced a privacy breach doesn't mean it's not vulnerable to identity theft and corporate fraud. Organizations of all sizes and types are at risk of having their confidential and sensitive information stolen and misused. All document destruction takes place on-site at your business while you watch. Whether you choose our one-time purge service, or our scheduled document shredding solution, you can always expect timely service, fair pricing and the utmost in professionalism. Call us today or complete the form on this page to learn more or receive a free quote! None of our document destruction processes are outsourced. 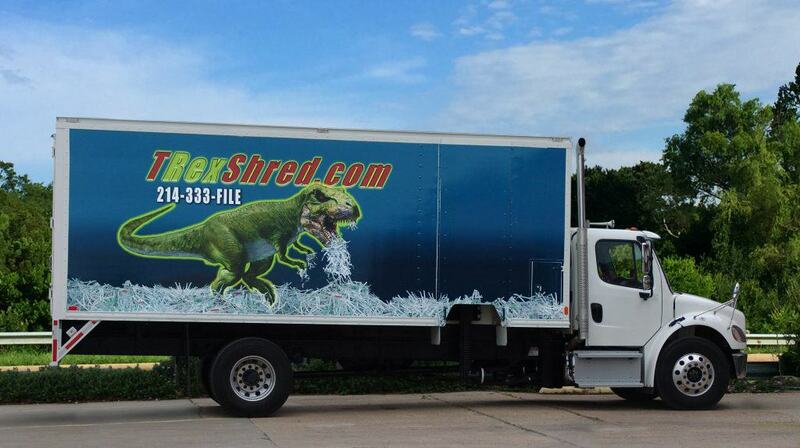 From start to finish, screened and uniformed TRexShred shredding technicians collect, handle and destroy your documents with a strict chain of custody process. In-house shredding with an office paper shredder is cumbersome, inefficient and counterproductive. Although a stack of old, outdated business records may seem harmless, in reality they take up valuable space and increase privacy breach exposure for your company. Our one-time purge service offers a quick, easy and affordable solution for destroying your expired documents. Whether you have an entire file room filled with old stacks of paperwork or just a few boxes of documents, we destroy your information on-site at your business and give you a Certificate of Destruction for documented proof of HIPAA, FACTA, SOX and GLBA compliance. For more information about our shredding services in Fort Worth, please contact us at 214-333-3453 or complete the form on this page.